Lady Cats Softball Coach David Carrillo asked his team if they were ready to step it up Tuesday night (Apri 2) against Texas High at Lady Cat Park. Team members answered in the affirmative and then went out and stepped it up. 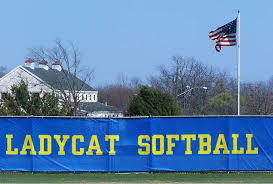 After getting only three hits in a loss to Mount Pleasant last Friday night, the Lady Cats collected 16 hits Tuesday night in a 15-5 ten run rule game. Coach Carrillo said the team’s mindset was that they might have to outscore a good hitting Texas High team. For awhile it looked like that might be the case as the Lady Tigers only trailed 7-5 at one point. Coach Carrillo said lead off hitter Kelsey Wallace set the tone with a home run. He said Brinklee Driver also had a good game. And then there was Sierra Smith. Coach Carrillo called her the complete package Tuesday night with 6 RBIs, a grand slam home run and with several ESPN style defensive plays. He also praised pitcher Bailey Haggerty for shutting down the Lady Tigers after their five run inning to make it a 7-5 game. Coach Carrillo noted Texas High did not score another run. He said the Lady Cats needed to shore up some things on defense. The Lady Cats completed the first half of district play with a 4-1 reord. They open the second half by hosting Royse City Friday night. Coach Carrillo said they have pitchers and hitters that present a challenge. He also said the Lady Bulldogs will be tough because they are fighting for their playoff lives. Coach Carrillo said the Lady Cats can clinch a playoff spot with a win Friday. He also wants another crack at Mount Pleasant and he wants his team to go into that game with only the one loss they have right now.